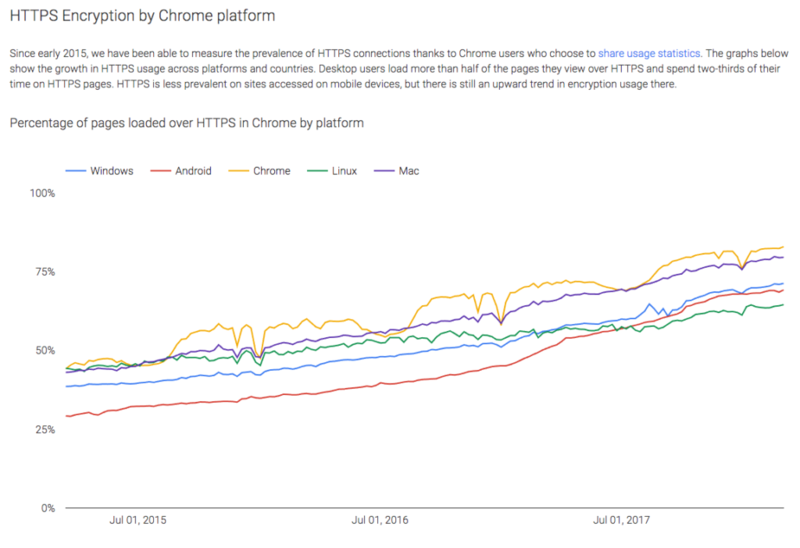 BlogWranglers migrated nearly a dozen sites from HTTP to HTTPS in the last month. The trend to HTTPS is clear. We found a few sources that have been tracking this trend and share them below, along with a few reasons. BuiltWith is an Australian website profiler that has been around since 2007. 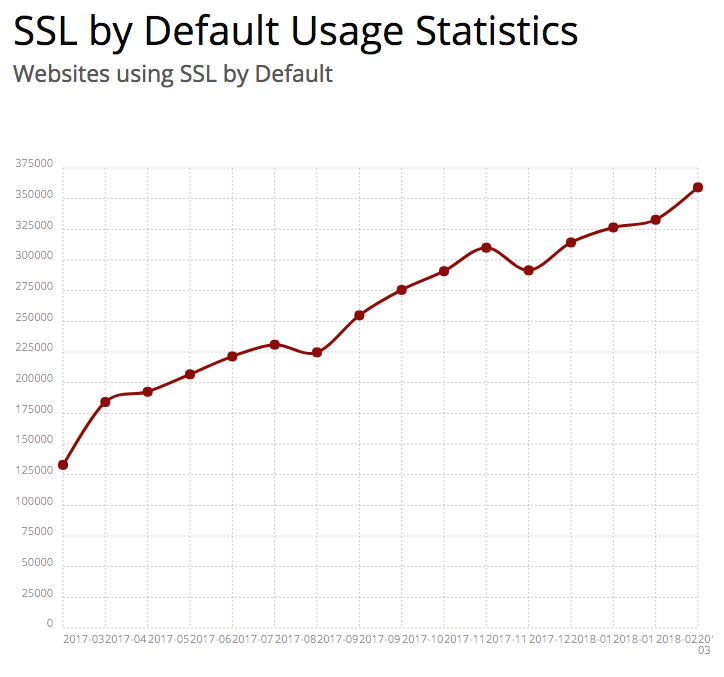 The following chart shows the increase in usage of SSL among the top 1 million most visited sites on the web from 125K to 365K. Over at Google, when permitted by the user, the Chrome browser tracks the number of sites visited that have HTTPS enabled by default. Below we see the incline extend from 50% to 75% HTTPS usage, last year. 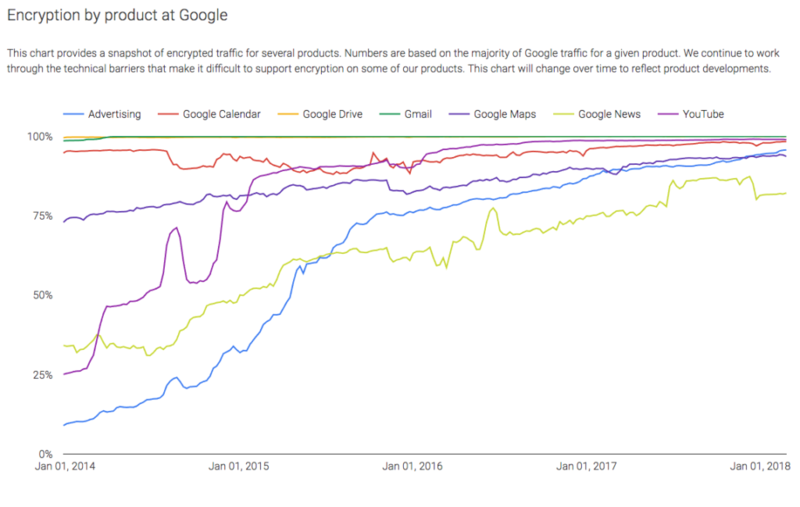 Additionally, Google themselves have been steadily increasing the adoption of encryption across their product line as seen in the following chart. Why are we seeing the switch to HTTPS? Security is the primary reason to switch from HTTP to HTTPS. A website using HTTPS communicates between the website server and the browser of the visitor securely. It protects the users’ data from hackers using the man in the middle (MIM) attack, for example. An SSL Certificate is a group of data files placed on your hosting provider’s server that enable the encryption and decryption of the connection between the browser and the server. A correctly installed SSL Certificate is what allows a website to display HTTPS in the browser. Back in 2014 Google confirmed that they want sites to convert to HTTPS and treat these sites favorably over sites that are HTTP. 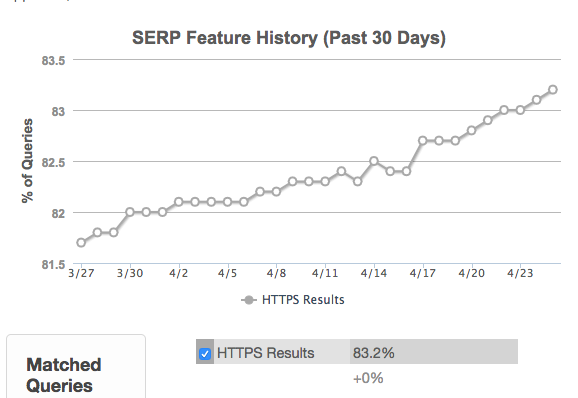 Over at Moz (an SEO consulting firm), they run a nightly Google SERP Feature Graph which shows a steady increase in HTTPS adoption among their query set. More than 83% of the 10,000 sites they query already have HTTPS. Another important SEO factor relates to referrer data and analytics. In Google Analytics, HTTPS to HTTP referral data is blocked. This means that all of that traffic will not be visible in your analytics until you join the party and switch to HTTPS. Then you can see that traffic. Furthermore, there is evidence that conversions increase after the switch to HTTPS. This means more people filling out contact and lead forms. Taking the time and effort to make your site secure will increase trust from the visitor. The HTTPS in the URL and the small green Lock in the browser are visual indicators that their information is safe. GlobalSign, a web-trust certificate provider, shares that 84% of website visitors surveyed indicated that they would abandon a purchase if they knew the data would be sent over an insecure connection. As with other trust factors like credit card logos, testimonials, and many big company client logos, this is another important trust factor that will lend credibility and trust. Google’s Chrome browser is leading the charge in alerting users that they are about to visit a site that is not secure, not HTTPS. Beginning in July 2018, Chrome will show the following warning when trying to visit HTTP sites. Not secure in a red font with a red danger triangle icon. Firefox and other browsers are expected to follow Google’s lead in marking HTTP sites as unsafe. Why not switch to HTTPS? There are plenty of good reasons to switch your website to HTTPS. Depending on the type of SSL Certificate that is appropriate for you, there may be a cost for the SSL Certificate. You will need a developer to work on your site and then test to ensure that all links to style sheets, scripts, all pages, and all images are converted to HTTPS. You will need to add your site again to Google’s Web Master Tools (Search Console) because HTTPS is considered an entirely different site. In addition, check your CDN and make sure they support HTTPS. Most do. The time has come for all good sites to come to the aid of securing the Internet and switch to HTTPS. If you would like us to help you with the process, head over to our sister site, JBSPartners.com, and fill out the HTTPS Conversion form. We will get in contact with you right away. What has been your experience with HTTPS or your interest in migrating to HTTPS? We would love to hear from you in the comments below. This entry was posted in Current Blog Trends, Search Optimization, Software and OS Tips. Bookmark the permalink.